Hyacinth Quilt Designs: Scrappy Trip finish! 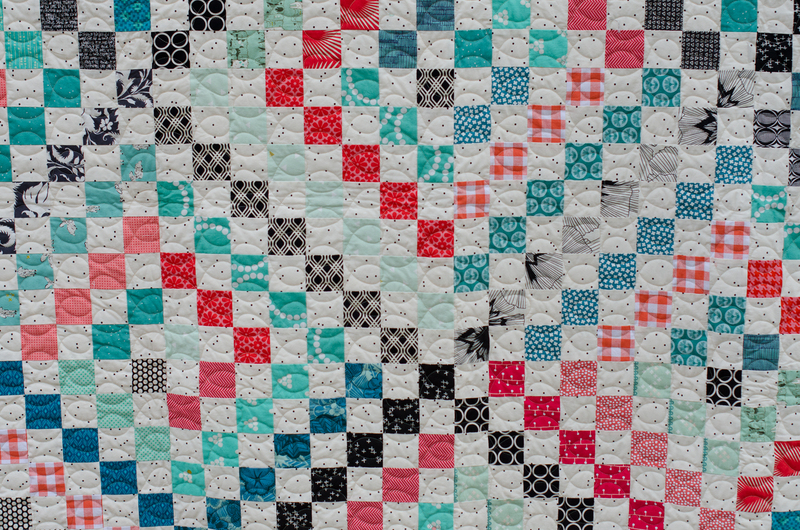 Unless this is the first quilty blog post you've ever read, I'm sure you're familiar with the Scrappy Trip quilt! I explained my modifications and how I pieced it here. In my "quilt it up" quest, I took this one to my local Bernina store to longarm quilt it. I thought I'd share a few pics of the finished quilt today! I quilted figure 8 loops on the quilt which I'm really happy with. They are all done free hand, but I was able to use the grid created by the squares to keep them fairly close in size and evenly spaced. I'm also pretty happy with how my "unscrappiness" turned out! For the back, I used this awesome print that I've been hoarding for just the right quilt. It's from an Art Gallery line called Cleta. Don't you love those trees made from bikes?? The quilt has been put to good use by my husband. I hear it's great for napping! Great finish, and your opening sentence cracked me up. Clever use of the design to help gauge your quilting dimensions. And as my dad would say, "Every quilt should be tested by an experienced napper." May it bring great enjoyment to all who nap under it. Turned out great! 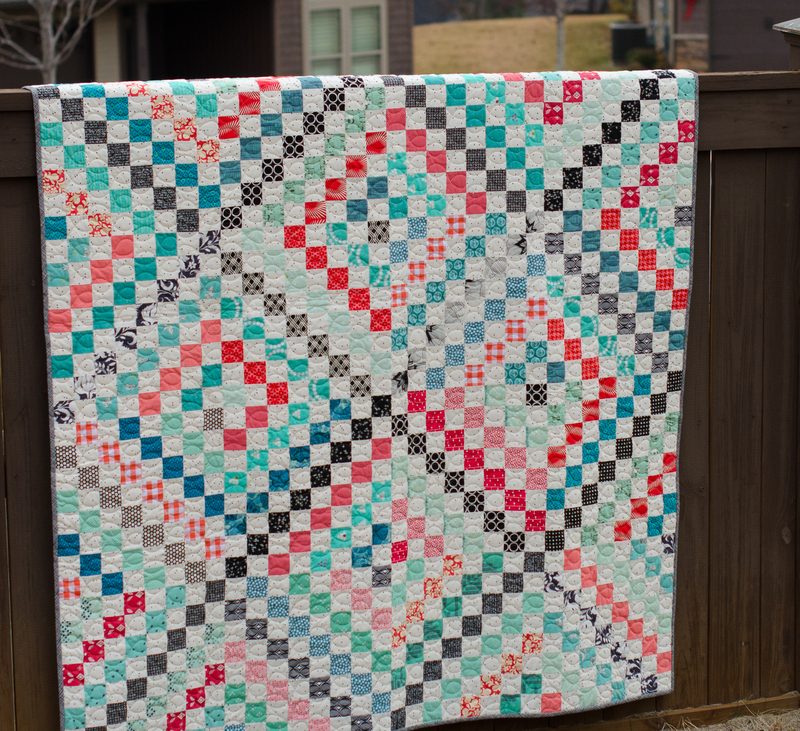 Love the color combo AND your quilting! The C&S subtle low volumne background is nice too! The black accents really make the quilt shine. 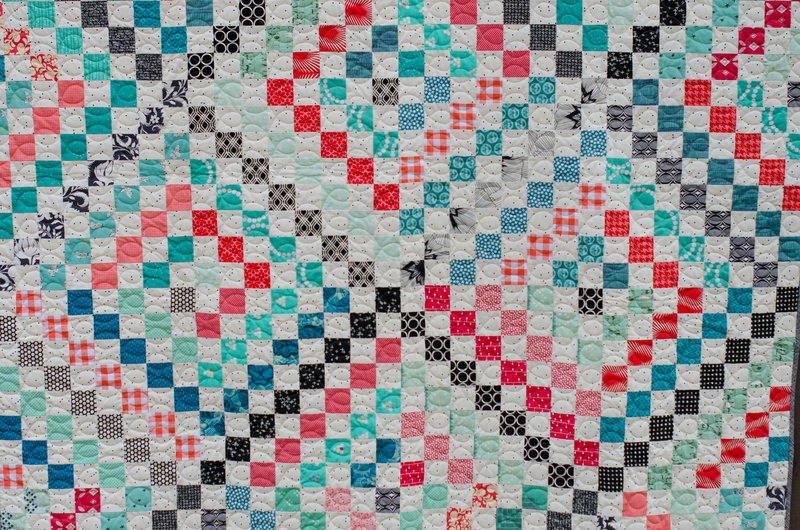 I love your color choices and your quilting motif too. Did you use the traditional 2.5" size strips for your squares. This is one on my "to do" list if I ever get my other UFOs under control. This coming year I'm really going to try harder to get a handle on my ever growing stack that need to be quilted. Cindy, it's just stunning! I'm eyeing a little pile of fabric over in the corner and thinking, 'hmmmmm, those fabrics would be perfect!' Enjoy your day! Beautiful quilt with an awesome backing. I love it! This is on my list also to make, soon I hope! This quilt is absolutely lovely! Just the right amount of controlled scrappiness to keep it from that eye boggling madness that some scrappy trips end up having. 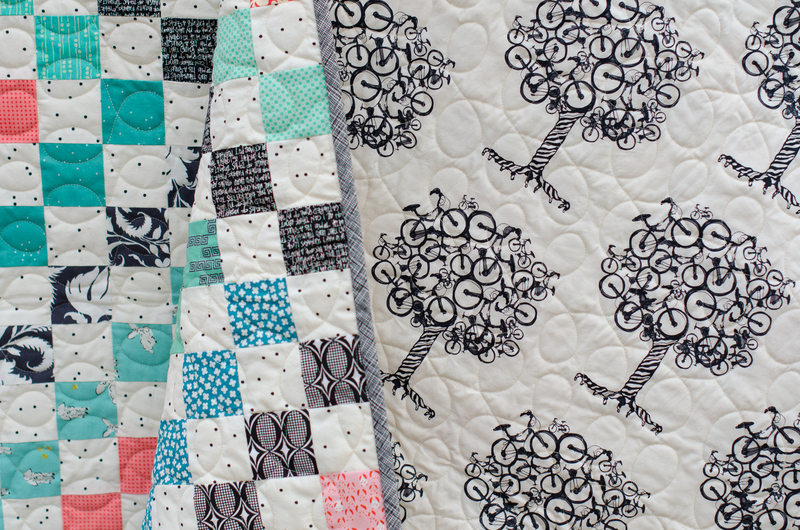 I totally understand why you hoarded the bicycle tree fabric, too. This is the perfect quilt for it, though! I have added this pattern to my list for 2017. It is beautiful. Love the backing too. Merry Xmas. It's beautiful!! Yes, this is a pattern that is very popular, but for good reason! Each is unique to the maker and yields such a lovely finish! I need to make another!! I love your colors! I never thought of sewing every other strip with white - and it works! Then there's that backing....oh, my.....I'm going shopping!